Photo: Children at our Hope Center campus are excited about the coming improvements to their facility. Today we bring you an update from our main campus in India, which was recently affected by a severe tropical storm. Our campus wall and our vegetable gardens were significantly damaged — part of the wall collapsed, most of the plants died, and part of our electrical system was destroyed. But we are thankful that all of the children are safe. Repairs to our campus wall and gardens are now underway. Our native team has torn down the old wall in order to build a new wall, and construction has begun. With your support and generous contributions from our donors, we will be able to fund repairs to our campus wall and garden, and also replace some doors that were damaged during the storm. Also due to adverse weather conditions this summer and fall, we were not able to plant rice this year at our new rice farm. However we will prepare our land for the next rice planting season in June. We are also planning to drill a new well at our farmland to improve irrigation, to help keep the land cultivated for growing vegetables before the rice planting season. In addition, we purchased some excellent soil to aid the growing of our on-campus gardening projects which are yielding produce such as eggplant, tomatoes, green chilies, curry leaves, and beans. We hope to draw a wonderful profit from the gardens, and we are thankful that the harvests of organic vegetables from both the ground level gardens and the rooftop gardens can be used in the children’s meals. We are happy to report that the installation of the new bathroom facilities on the third level of our Girls Home is almost complete — so far, 9 toilets have been built, and just a few finishing touches remain. When construction is completed, there will be 10 separate toilets along with solar-powered hot water and a reverse osmosis purification system, thus aiding the girls’ privacy, comfort, and hygiene. The separate toilets will help the girls get to school on time since they won’t have to wait in line any longer. The older girls of the Girls Home have been enjoying their third level upstairs space with freshly painted walls and an abundance of sunlight that comes through the large windows. Now they are overjoyed to soon have new bathroom facilities on their own floor, such a comfort and a blessing. Photo inset: (Top-left): Girls at our India Girls Home are thankful for plants that survived the recent storm. (Top-right): A student at our Children’s Hope Center in Hyderabad assists a younger student during her computer education time. (Bottom-left): Boys at our Hope Center are grateful for a safe place to further their education and receive a healthy meal. (Bottom-right): Girls at our India Girls Home are delighted that their new bathroom facilities are almost complete. In other good news, we are adding a second level to our Children’s Hope Center in Hyderabad, India — we have gathered all of the building materials, and we plan to raise the support pillars first, which we may be able to do by Christmas. Previously we were using the existing ground floor and its two small rooms for a study hall and a computer lab. It’s been a bit crowded for the 40 children enrolled this year as we’ve been trying to use the same study hall for preparing and serving meals. The additional second level will become the study room which will give the children a more comfortable and peaceful environment to do their studies and excel in their education. 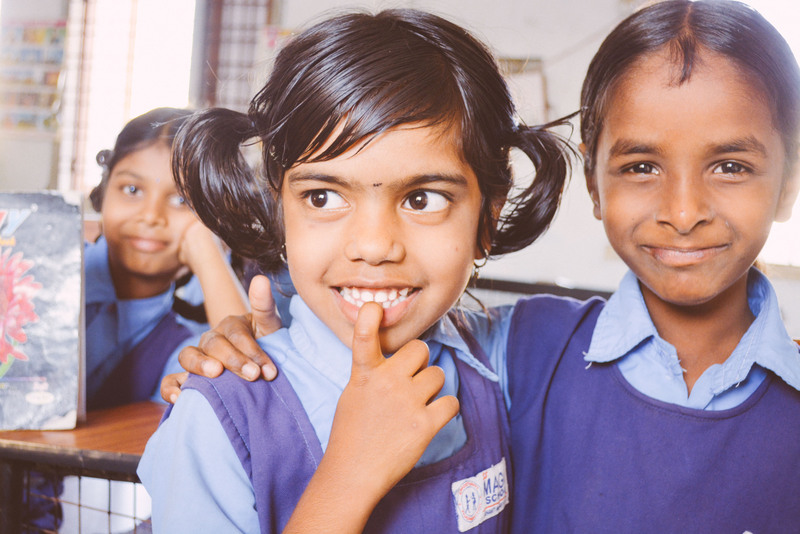 Through the work of The Children’s Hope Center, we are rescuing children from child labor which is one of the leading precursors to child trafficking in India. The model of the center is that of education assistance — a scholarship program and an after-school care program. We provide the children with everything they need to enroll in a local school: uniforms, shoes, backpacks, and school supplies. Then we pick them up from school, and our teacher and her assistant help them with their homework in a classroom setting at the Hope Center where they also have access to computer education. They leave each evening after eating a fresh-cooked meal. It’s in this environment that our Children’s Hope Center is bringing just that — hope, to the children of this slum colony located on the edge of the city’s largest landfill. We are extremely grateful for your prayers and for your faithful support, and we look forward to reporting back with our progress in improving the lives of these children. Have a blessed holiday season!